So many new storage customers ask us “How do I pack my storage unit?” as they prepare to rent with us. Well, we have the moving essentials, packing tips, and organizing expertise to help you! From packing up your belongings to packing up your storage unit, we would love to show you how to get it done the right way. Make a list and check it twice! Keeping a checklist handy helps you make sure you not to forget to pack something. This is especially true if some of your belongings need to go into your storage unit, while others need to go somewhere else. As you get things packed, check them off your list and keep the list as long as you have your storage unit. You may forget something is there after a while! Get an assortment of boxes to fit everything you want to store. If you find that you’re running out of boxes, just head to your Modern Storage location and you can buy more from us! Any leftovers can be returned through our buyback program. Anything small or loose needs to be boxed up, but larger items can be wrapped and stored individually. Wrap up all furniture, electronics, artwork and other large items so there aren’t any scratches on them after moving. Bubble wrap is great for this step, and we have plenty at every Modern Storage location if you need extra. Delicate smaller items going into boxes need to be carefully wrapped as well. Try not to pack them too tightly, as that will put too much pressure on the items in your boxes while they are being stored. You don’t want anything to break or crack! Making sure you have strong packing tape during a big move is always important. Tape up every box seam and run a couple lines of packing tape across the top and bottom. Again, if you ever run out of tape, just stop by Modern Storage and we will help you out. You need to protect your mattresses, pillow, and bedding, no matter how long you plan to store them. Even if you don’t utilize a storage unit, dust, dirt, and other elements can easily infiltrate these fabrics whether they’re in a closet, attic, or storage unit. Bag them up before you move them! If you need a mattress bag, we have them available in the twin, queen, and king sizes. Now that you everything bagged and boxed up, make sure you label your belongings. This will make moving your items, packing your storage unit, and locating items later so much easier. A thick permanent marker is perfect for this step. Just make sure you place the same label on all sides of your boxes (except the bottom). This step makes your boxes easy to read when facing any direction. Before you head off to your storage unit, make sure you have a door lock. 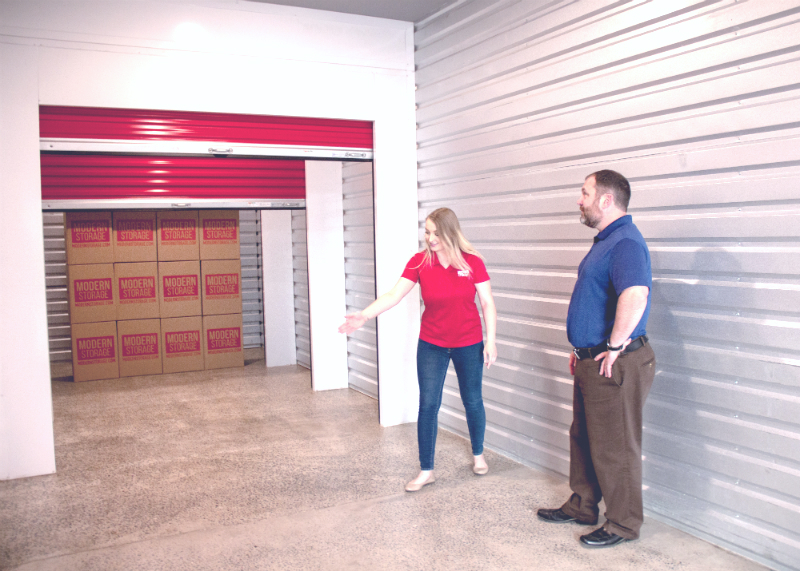 Locking your storage unit is crucial to keeping your items secure. We have both pinhole and disc locks available onsite if you forget to buy one! Once you arrive at your storage unit with a truckload of belongings, staying organized and packing your unit well is key. It’s important to strategically place your items around the unit in a way that makes sense to you, especially if you will be storing them for a long period of time. Any items you might want to access or pick up sooner than others should go in the front of the storage unit. Large items you don’t need or that can block your access to smaller items can be placed in the back of the storage unit. Turn large pieces like your couch on their side to save some room. Place boxes on top of larger items or heavier boxes. Utilize shelving racks where possible to stack up smaller items. We have some you can rent! Leave a little bit of “breathing” room between stacks and piles. If you’re renting an outdoor storage unit, consider getting some risers to keep your items off the ground. If you have any other questions about Little Rock storage units, contact us today for assistance from one of our helpful customer service representatives.